This post may contain affiliate links. See my Full Disclosure for details. Crock Pot Cowboy Beans are a hearty and filling side dish made with a pound a beef, a pound of bacon, and three kinds of beans, all slow-simmered in a sweet and tangy brown sugar molasses sauce. You'll have to forgive me for the quality of that photo up there. I took it on the fly and never bothered to check if the image was totally in focus. Apparently, I was moving a liiiittle too quickly in my rush to take a last minute shot that I shook the camera, as you can obviously see. Shame on me. I am not being a very good food blogger when I take crappy photos. Every time we have a party or when we host holiday celebrations, I always have the best intentions to photograph my new recipes, I swear I do. This time was just like all of the others. I get all wrapped up in last minute cleaning, getting myself and the kids ready, and making sure all of the food is plated, that I forget to take pictures. I usually remember when the party is in full swing and people are chowing down. I have a bunch of awful party food photo shots. 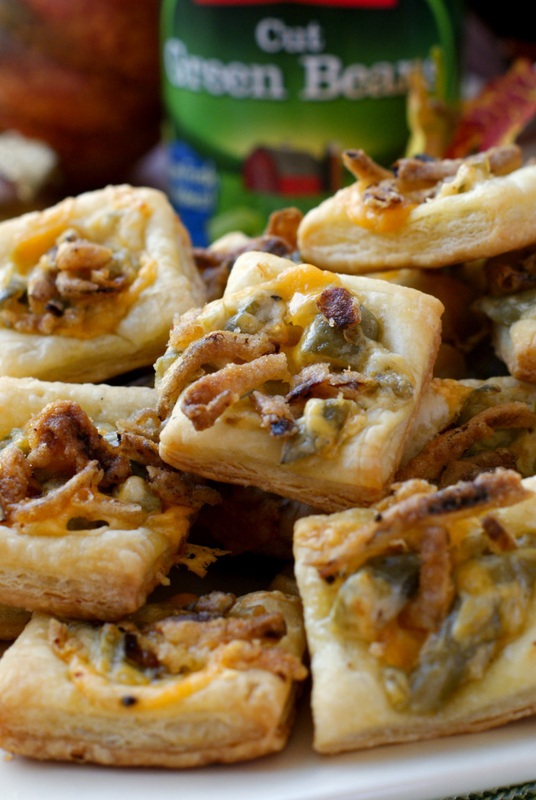 Check out this one of my Caramelized Onion Dip with Bacon. Or how about this one of my Baked Buffalo Chicken Wings with Kicked-Up Ranch. Embarrassing. Ah, well. Maybe one of these days I'll get to planning a little better and get better shots of my party food. Awful photograph or not, these beans were so yummy and super indulgent! Usually, when a recipe calls for a pound of bacon, I say, "Where do I sign up?" They were the talk of my little guy's second birthday party! EDIT: I finally shot some new photos of this delish recipe! It only took four years! Haha. Check it them out! Ahhhh, a little close-up action so you can see all of that delicious beany goodness. I can honestly say that, four years after publishing this recipe, these beans are still THE. BEST. Over the years I've gotten review after review across social media with folks singing this recipe's praises! 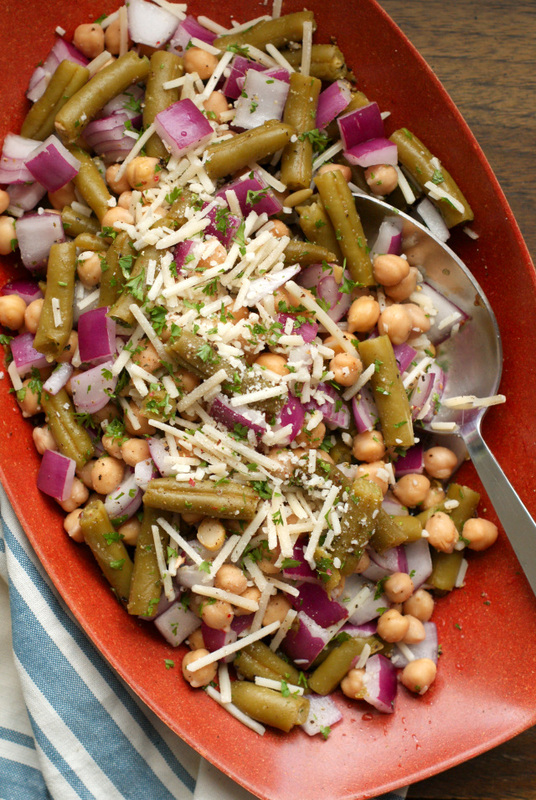 Not to mention the fact that these beans are now the number one searched recipe on the blog. I tell you, there's a reason for that. They are just that good. I even made a fun little video to accompany this stellar recipe. It's always fun to watch a recipe come together. This short video is just under a minute long, so take a minute to watch! So fun, right? This recipe doesn't get much easier. Just dump the ingredients and go. Love, love, love it. Have you tried this popular recipe? If not, what are you waiting for?! Get on it, then come on back and let me know what you think in the comments below. Enjoy! P.S. I always use a nice big crock pot for this recipe. If you use a small crock pot, it won't fit all of the beans. Go with a 6-7 qt. This is the crock pot I use and I absolutely love it. I don't have the little dipper, but I wish I did! 1. In a large skillet, cook the ground beef and onions until the meat is no longer pink; drain. 2. Drain and rinse all of the beans except for one can of pork and beans. 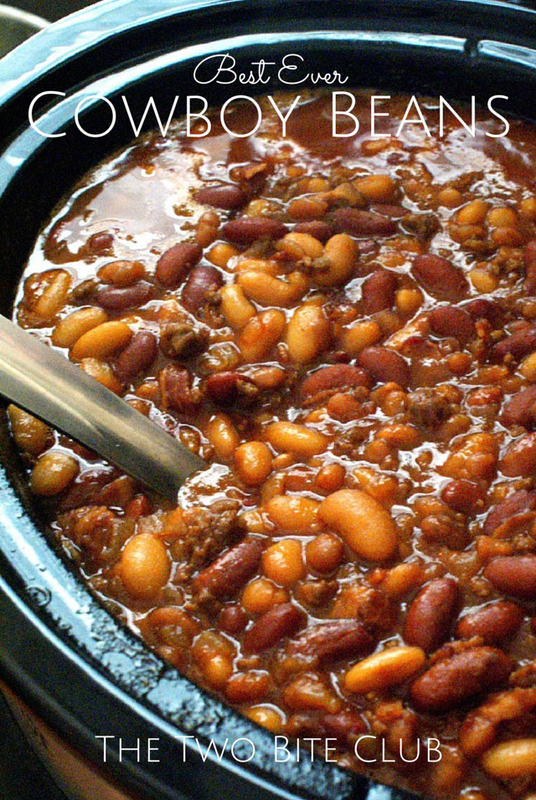 Combine the beans, cooked ground beef and onions, and remaining ingredients to your crock pot. 3. Cook for 4 hours on high or 8 hours on low. This recipe makes a TON of beans. Plan to use a large oval crockpot or halve the recipe. I served 20 people and still had leftovers, but everyone was more than willing to take some home! These look super yummy! 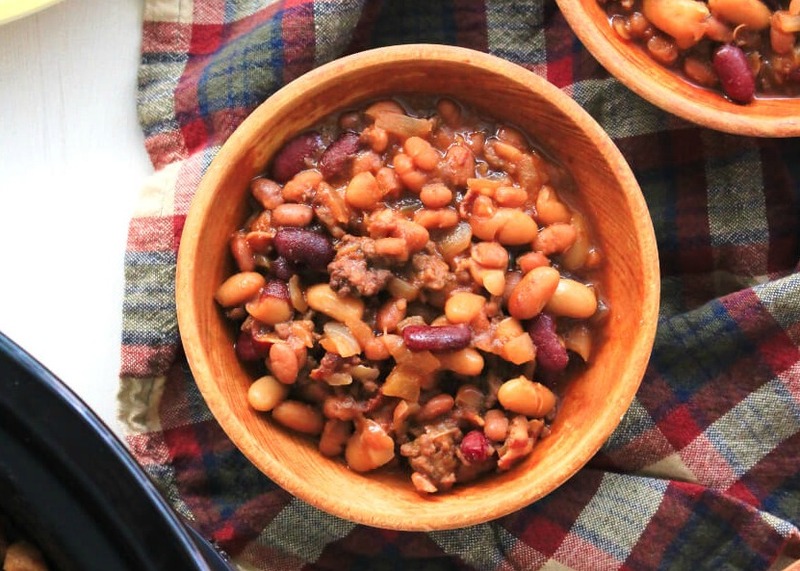 Beans are my husband's favorite, and I love crockpot versions! I'll definitely give these a try soon! 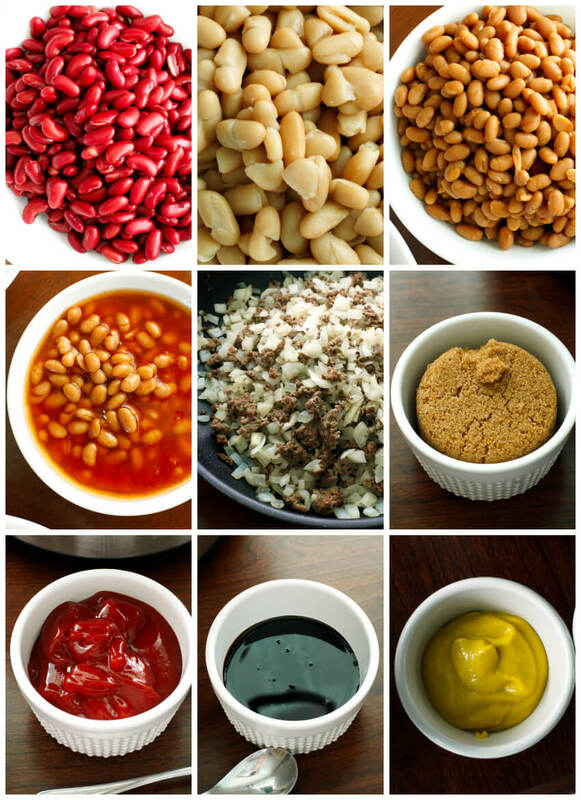 I have made these a lot, but do not always add different kinds of beans and instead of mustard I add horseradish. Yummy! Would these freeze well? I was thinking of making the entire batch and freezing leftovers. If not, I'll just cut the recipe down. These are our favorite party beans. Do you add any liquid (ie: water)? No, I don't add any liquid. Do I have to add meat..
To get the full flavor, I'd say yes. It's definitely not a vegetarian recipe. I used veggie crumbles, meat substitute, and they turned out great! Could you freeze this recipe? If yes would you cook the meat first,strain it and then add it to the freezer bag to be place in the freezer or leave the meat raw? Thank You! you would definitely want to cook the meat first, make it in a bowl, and then portion / freeze. Looks and sounds delicious by the way. They have another name.... called SUPER BEANS. I ate them many times at a small locally owned restaurant in Tenn over 10 years ago. Mmm, I think I will try dijon next time, too. Great idea! Do you cook the beans first? The recipe calls for canned beans that do not require cooking before they get dumped into the crock pot. I don't see reference to when the bacon is added and if it is cooked first. Made this a few weeks ago for a gathering at my church and it was a hit! Several asked that this my dish to bring anytime we eat and we eat a lot of times! Thanks for a successful recipe! Adding green bell peppers. Hope it works. How much Worcestershire sauce do you use? Thanks in advance. Nowhere in the directions do you mention the bacon....I assumed that it should be mixed in with all the other ingredients at the same time. So that's what I did and they'll be ready in a few hours! They're smelling good,I just hope I wasn't supposed to add the bacon crumbled on top when they're done! Its not confusing at all- you say to cook and crumble in the ingredients and then you say, "add remaining ingredients". Throw a TBPS of liquid smoke in these baddies. I've made these many times now. Always a hit! Thank you! They are sweet, but not too much for my family. I would say yes for the bean switch! 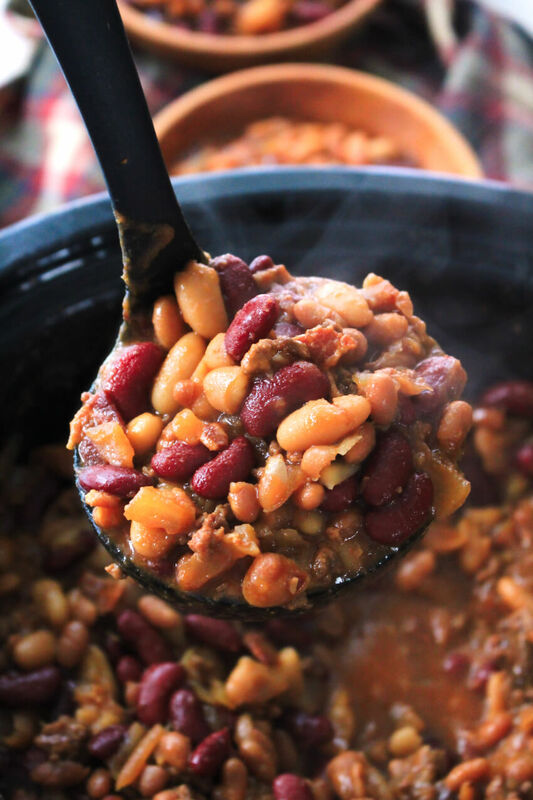 I put a similar recipe in my book, A Texas Ranger in Arizona, at the end of Chapter One, called Campfire Beans. This was the third of the Spence Pierce series available from Amazon, Barnes and Noble and other book stores. Available on Kindle and Nook books. Great Beans. Used 50% molasses 50% agave in the raw. Awesome. I put them into my smoker to cook instead of slow cooker and they were awesome !! Nice! We use our smoker at least once a week during the summer. I am totally going to try that! Yes they can be frozen and no you do not have to add meat. Cowboy beans have been a fav in my family for years. I plan on trying this variation. Is there a substitute for the pork and beans? I would like to make this without using canned prepared foods. You can use whatever beans you like. If you want to use dry beans pre-cook them and carry on with the rest of the recipe. will this recipe be too much for a 5 qt crock pot? It will be tight! I've made them in a 5.5 qt crock pot. I want to serve 4-6 people with this recipe. I'm confused of how to halve the ingredients! Please help! Tip: I use an app called Recipe Keeper for all my recipes. It allows you to adjust serving size up or down and makes adjustment to ingredients for you. But doesn't permanently alter the original recipe. I tried it. Didn't have molasses so I used extra brown sugar. I liked it. My husband loved it. Thumbs up. I think this is good for 4th of July with some franks. I have been making these for years but call them Calico beans. I also use butter beans and lima beans. Very nice looking with all the colors in there. serve approximately 125 people. Thanks for your input. I have never made a batch that big! Did you end up trying it? How did it turn out? I've been making this for years!It was called Beverly's Beans. The only difference is the bacon was put in the skillet with the ground beef so it's not crispy which I like! It also calls for 2 cans black beans,1 can pinto beans,1 can kidney beans,1 can white beans,and 2 cans pork n beans. Always a big hit at pot lucks! 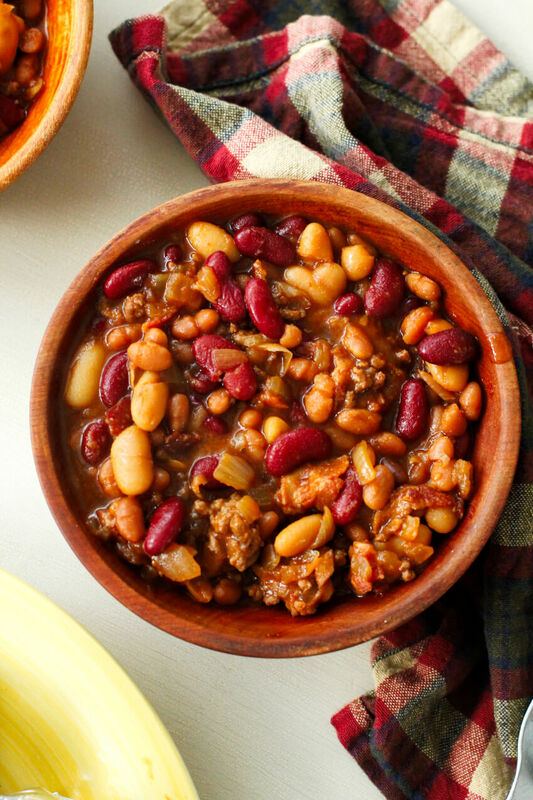 Can i make homemade baked beans for this recipe instead of using 3 types of canned baked beans? Will it have any change in the texture and the flavor? I use bush beans. I have also made it with Italian sausage. Making these in my dutch oven when we go camping! Yum! We are going camping this fall. I think I'll add them to the menu! Wish I could understand why they wont allow you to print this recipe. Sorry about that! I'm in the process of updating each post to include a print button. It should be fixed now! Are the beans mushy after cooking (already cooked beans) that long in the crock pot? I just made these this weekend for a football party. I had ZERO leftovers. So yummy. Because I'm lazy, I used pre-cooked bacon. I chopped it up and added it to the hamburger when it was almost done browning. We had picky eaters in the mix so I omitted the onions as well. I also used a combo of different beans - really don't think there is a way to mess this one up. Thanks! Can't wait to try these. But I will definitely have to cut it in half. So glad it doesn't call for lima beans which I detest. Not without cooking the beans first outside the recipe! They won't cook properly with so many other things in the slow cooker, they really need to be cooked first, then follow the recipe. 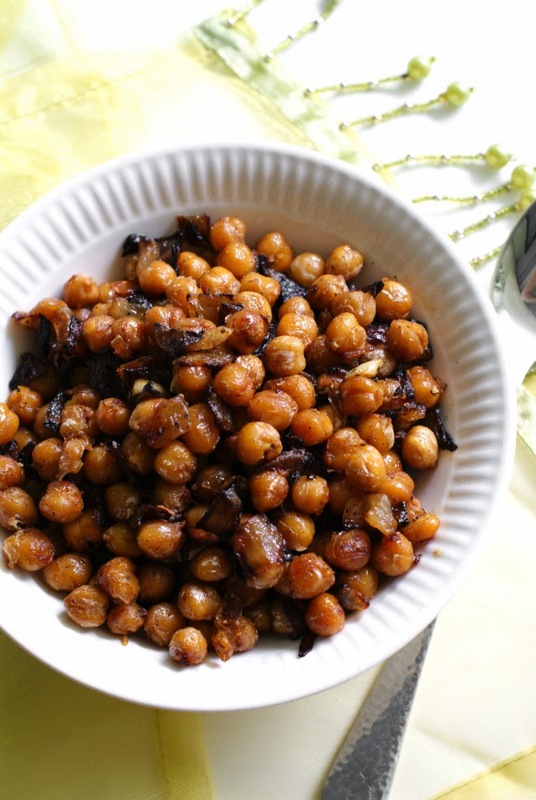 My former MIL made these for decades using dried beans, and the one time she thought she could "save time" by just soaking them, then putting them into the slow cooker was the one and only time she absolutely ruined a great dish...beans were as hard as if they'd never been cooked at all. Made this a few times Needs heat. I put cayenne peppers in it. Also I grilled some country ribs threw them in omitted the bacon and let cooke full time. Looks AWESOME, How many does this serve? I made these yesterday for a end of the summer bbq/birthday party. They are fantastic! I got so many positive comments and thumbs up. Delish!